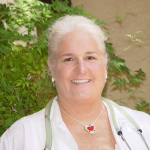 Dr. Valerie Olmsted is a Naturopathic Physician practicing in Sedona, Arizona. She graduated from the Southwest College of Naturopathic Medicine, in Tempe, Arizona, in 1999 and has been in solo practice since. Prior to becoming a doctor, she was a C.E.N. registered nurse (Certified Emergency Nurse) and has over 30 years of experience in the medical field, including ICU/CCU, Home Health, and Home Hospice. Her practice is centered on Blood Type science, utilizing Dr. Peter D'Adamo's principles to successfully treat her patients. She is a Fellow of the Institute for Human Individuality, as well as a minister (Rev.Dr.). The practice is one of preventative and chronic disease medicine, including man's and women's hormones, psychotherapy, acupuncture and oriental medicine, nutritional and botanical medicine, homeopathy, spirituality, and minor surgery. 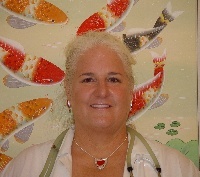 Dr. Valerie Olmsted is a Naturopathic Physician practicing in Sedona, Arizona. She graduated from the Southwest College of Naturopathic Medicine, in Tempe, Arizona, in 1999 and has been in solo practice since. Prior to becoming a doctor, she was a C.E.N. registered nurse (Certified Emergency Nurse) and has over 30 years of experience in the medical field, including ICU/CCU, Home Health, and Home Hospice. Her practice is centered on Blood Type science, utilizing Dr. Peter D'Adamo's principles to successfully treat her patients. She is a Fellow of the Institute for Human Individuality, as well as a minister (Rev.Dr.). The practice is one of preventative and chronic disease medicine, including men's and women's hormones, psychotherapy, acupuncture and oriental medicine, nutritional and botanical medicine, homeopathy, spirituality, and minor surgery. With over 30 years in the medical field, Dr. Olmsted has been involved in the treatment of patients with usual, unusual, and truly bizarre illnesses and injuries. Having been in the allopathic medicine field for so long, she has had ample time to witness the effect of drugs, surgery, radiation, and other treatments, most of which helped people, but some of which harmed them irreparably. The fact that many people return for treatment of the same preventable disease is what caused her to look for another type of medicine. When someone is coming in for their third open heart surgery, and everyone is joking about having the surgeon put in a zipper, she states, you have to wonder what we did that was so great: why are they coming back with the same problem yet again? After battling with medical professionals ignorant of the importance of nutrition (including registered dieticians), and being reprimanded for talking to people about proper nutrition, she became angry and decided to find a better way. Naturopathic Medicine is that better way for her; she terms it a kinder, gentler, medical approach. Dr. Olmsted is known for her humorous style of speaking, and has given many talks through the years throughout the Phoenix Valley. I love to get people thinking about what's best for THEM. she laughs, They always seem so amazed that I know what they've felt and thought concerning their bodies, and what's currently going on in their households because of it. I encourage them to ask questions, and bring their loved ones in. No one is healed alone; we are beings who need community. Her most popular speaking engagements have been on Blood Type Diets and Hormones and there is always much laughter with both. People leave her talks understanding their bodies and responses more, and are grateful to find out they are not suffering alone. She has used the Blood Type science with all of her patients, and is pleased to say that it works every time. Once a patient goes through a few weeks of treatment based on Blood Type science, the change is often so profound that the patient becomes a convert, trying to get other people to listen to reason. Dr. Valerie's mission in life is to get as many people as possible (especially children) educated as to proper care of the body so disease may be prevented. She likens our knowledge of the body to the premise of the TV show The Greatest American Hero we have the suit, but not the instructions of how to operate it. Science is getting more information daily about how the body works, and why. And each day we are finding more reasons that our modern lifestyle is killing us, as we have moved away from the natural principles practiced by our ancestors. Dr. Olmsted sees Naturopathic Medicine as a nexus that allows each person to find the best path to health, in the way that suits him/her individually, and guides her patients to take full responsibility, and participate fully, in their healthcare. Choosing a naturopathic physician is an ongoing educational experience in the pathway of health. The first office visit usually entails a complete physical exam and history. A treatment plan is generated based on the "working diagnosis"; tests are ordered and evaluated to confirm the diagnosis. This is standard medical procedure in any doctor's office. Sometimes palliative treatments may be started before the complete diagnosis has been determined this is done to alleviate pain or discomfort as soon as possible. Educational materials may be provided, as well as instruction in particular therapies that may be continued in the home setting. The most important part of the care provided by a naturopathic physician is that of involving the patients in their own care. The physician acts as a teacher of health, educating people in the ways and means of attaining health and healing. By explaining the processes of health and disease, the physician seeks to empower each person with the knowledge and confidence necessary to be truly healthy. Naturopathic Medicine is a mystery to many of those in the conventional medical field because it is not "cookbook medicine". In other words, several people with the same disease would be treated completely differently, in a manner that best suits their individual situation. This approach often results in seemingly miraculous results. In reality, this is medical science at work, utilizing the best of all healing modalities, applied in a scientific manner, based upon scientific diagnosis. Medicines and therapies are then utilized as a means of changing biochemistry, bioterrain, structure and function. From her many years of experience in "conventional" medicine, Dr. Olmsted has found that many patients are unable to attain a state of health using the conventional drug therapies. She has also found that the normal state of function of the body is often forgotten by medical professionals in the race to provide results on demand. In an effort to assist her patients in their healing journey, Dr. Olmsted endeavors to spend the amount of time necessary to get to know her patients and their individual responses. In the journey of healing, each patient must be considered as an individual, unique organism. Naturopathic Medicine is a traditional medicine system which recognizes these innate differences. Dr. Olmsted strives to find the appropriate therapies for each person. Her goal is to help them find health in the most gentle, efficient manner possible. During the course of care, family members or significant others may be asked to attend with the patient. This is always done with complete consent of both parties. This is done in an effort to help educate those others as to the changes that will be occurring”to ensure optimum opportunity to make the necessary lifestyle changes. During the first visit, time is provided for questions as to how naturopathic medicine may be helpful to you.